At Calmar Stadshotell you find five comprehensively equipped conference facilities taking up to 200 people, and an additional four smaller group rooms. For larger parties we offer Kalmarsalen two blocks away with space for 800 delegates. Are you planning an event, large or small? We design a celebration out of your ideas. Fantastic balls, weddings, formal banquets or family gatherings in one of our beautiful party venues. We are happy to help you with activities during your visit. See Kalmar Castle, Glasriket, go horseback riding on Icelandic horses on Öland, seal safari or visit a museum. If you have any other wishes we gladly help you to find further suggestions. When in Kalmar you never find yourself far away from anything, and this gives you plenty of time to spare. Spare time for you to feel relaxed and find even more inspiration. Here, you will experience the vast possibilities of the big city embraced by a small town's charm. Are you planning a assembly of any kind? Do not hesitate to contact us for creative suggestions characterised by experience, originality and hospitality. 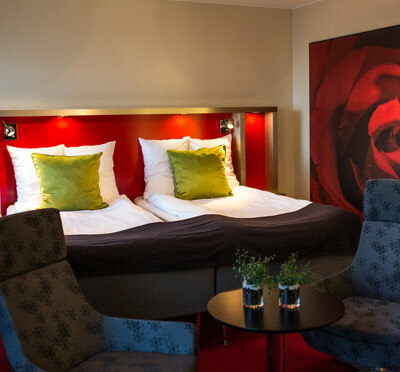 Have you been to Calmar Stadshotell and want to give your own comments?